It’s been another manic Monday as Cairns Unlimited gains momentum. The emphasis of our campaign is starting to shift, which brings new challenges. Until a few days ago, our main objective has been to market Cairns Unlimited to businesses. But now that the website is starting to attract attention, we have to turn our energies towards marketing to the end-user, the reader. Luckily, we had somehow made time to visit most of the city’s numerous car rental agencies, because RENTAL CAR ENQUIRIES have already started trickling in. I think that is going to be an extremely popular - and successful - side of the overall business. Readers submit their rental car enquiry to us, we then forward that email to every reputable car rental office in town, and respond to the reader within 24 hour with the best price available. It means the reader can contact every car rental company with one click, and because of our position in the market, they can be assured that the final ‘all inclusive’ price they pay is unbeatable. Heck, if you ask nicely, we’ll even organize a free pickup from the airport, the train station or your hotel! Yesterday, Maria and I visited the Tanks Arts Centre near the CAIRNS BOTANIC GARDENS for their annual “Body, Mind and Soul” market day. 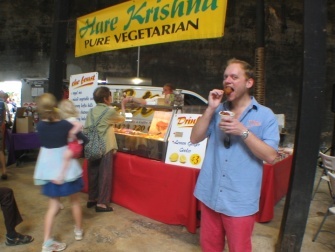 There were over 60 stalls promoting everything from massage to health supplements to meditation retreats, but my personal favourite was the Hare Krishnas’ food stall! The Tanks Art Centre is a fantastic venue, and until we approached, I hadn’t considered how it gained its unusual name. But it only takes a glance. 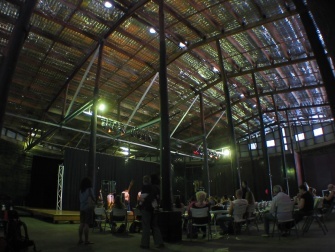 The venue (or more a series of venues) has been created from a number of massive disused concrete water tanks. You will see the Tanks Arts Centre featuring regularly in our ever-growing CAIRNS WEEKLY ENTERTAINMENT GUIDE, the first edition of which was uploaded just a few hours ago. There really is no shortage of things to do in this city, and in the surrounding area. The only problem is knowing where and when everything is on. That’s why we developed the Weekly Entertainment Guide, and as more and more venues and event organizers add us to their mailing list, you’ll find the weekly guide will develop into a comprehensive ‘What’s On’ around the region, from Choral Society productions, art exhibitions and amateur theatre nights, to wet tshirt competitions, pole dancing, local grunge bands and visiting DJ’s. The irony is that in spite of Google (and an exponentially increasing number of readers) obviously recognizing the merit of our site, we still don’t have a Google ‘Page Rank’. This is because the Page Rank is calculated by a site’s ‘backlinks’, that is, the links that other people place on their sites, linking back to ours. And at the moment, we have very few. Big thanks to Des, Rom, Hector, and to the Cairns Amateurs for your links. A big thanks in advance to the good blokes at WORLD NOMADS for linking to us as well! If you have your own website or blog, why not share a little love and post a link to your favourite page in Cairns Unlimited? If you don’t want to just have a boring text link, here’s a couple of sweet banners to choose from, designed by our friend Ceci, in Spain. This entry was posted on Monday, June 25th, 2007 at 12:59 pm	and is filed under At home in Cairns. You can follow any responses to this entry through the RSS 2.0 feed. You can leave a response, or trackback from your own site.